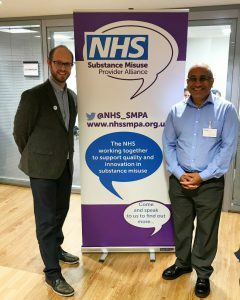 The NHS Substance Misuse Provider Alliance began in 2016. They are a coalition of NHS trusts delivering Drug and Alcohol Treatment throughout England. Their annual conference is a forum for innovators and experts to share their insight and drive improvement in the Drug and Alcohol treatment Sector. This year focused on creating positive, lasting behavioural change. It was attended by a number of key players within the industry, with presentations from the members of the Alliance sparking lively and thoughtful discussions. Danny Hames, Chair of the NHS SMPA (left), and Dinesh Visavadia, MD of ILLY Systems Ltd. This year, they were kind enough to invite ILLY along. Key Note Speech – Tony Adams, the former Arsenal and England Football player, spoke compellingly about his personal journey with alcohol and addiction. Now sober for 22 years, Tony founded Sporting Chance – a charity clinic that provides support and addiction services to sportsmen and women. Gambling and its effects on public Health – Dr Henrietta Bowden-Jones, the founder of the National Problem Gambling Clinic, talked about the prevalence of problem gambling in the UK and how it causes harm to society as well as the individual. It was particularly interesting to learn the similarities between substance misuse addiction and gambling addiction, and what lessons and treatment techniques can be applied to both. Danny called for substance misuse providers to work with other public health sectors to improve transparency and strengthen the voice of service users. Improving the quality of psychosocial interventions in addiction treatment – Dr Luke Mitcheson, Clinical Psychologist for SLAM NHS Foundation Trust, spoke about the 2017 clinical guidelines, the NDTMS sub-modality report, and the Opiate substitute Good Practice Programme as useful guides to help improve the quality of psychosocial interventions in Substance misuse. Why Families? – Viv Evans OBE, Chief Executive of Adfam, reminded us of the importance of children and families affected by substance misuse, and how services can be commissioned to meet their needs. NEPTUNE – Dr Dima Abdulrahim of the Central and North West London NHS Trust, is the main author of the NEPTUNE clinical guidance specialising in “club drugs” and novel psychoactive substances. Promoting recovery through discovery – Rob Eyers, Founder of the Telford Aftercare Team (TACT), gave an inspiring talk about his journey through addiction and how he set up TACT after seeing the lack of support available in the area during his own recovery. At ILLY we always welcome coming together with other members of the community to look at improvements to the sector. Our mission is to drive positive social change through the use of technology and data, and we believe that it is by working in partnership with the driven, innovative members of this sector that we will achieve this. We would like to thank the NHS SMPA for having us along- we’re looking forward to next year.